“Behind every great man - there stands a great woman.” This is an old saying, still quoted today, and the Roman Emperor Augustus and his wife Livia are the best historical proof of this maxim. The Latin word augustus, meaning “majestic,” “inspiring awe or reverence,” was an honorific granted to Octavian by the Roman Senate in 27 BC, and it became his formal name and also an imperial title, meaning Emperor, for all the succeeding rulers of Rome. When Augustus died in AD 14, he willed the title of ‘Augusta’, the feminine form of Augustus, to his wife Livia Drusilla, his partner for 53 years. (Tacitus, The Annals, Book 1, 8, 2). The title Augusta became the equivalent of the word Empress and thereafter was awarded by the Emperors to a variety of their female kinfolk, including mothers, daughters, and aunts. Augustus’ will also provided for Livia to be formally adopted into the Julian gens (clan) and to be renamed as Julia. Livia was the first and most important Augusta in Roman history and she set the high standards for all the succeeding Empresses. Her life story became the plot for numerous romantic novels but her true history is more dramatic than any writer of fiction could ever conceive. 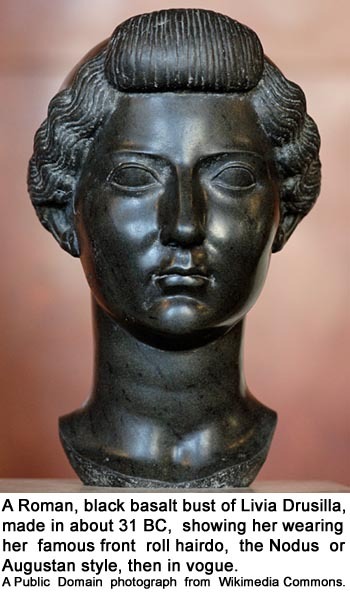 Livia Drusilla was born in 58 BC to Marcus Livius Drusus Claudianus and his wife, Alfidia. At age sixteen Livia was married to her cousin, Tiberius Claudius Nero, and gave birth to two sons, the future emperor Tiberius and Nero Claudius Drusus, the general and father of the future emperor Claudius. However, as a member of a famous family, Livia became a pawn of the dynastic and political plotters who arranged the unions of Roman aristocratic families. So after only four years of marriage, Livia was forced to divorce her husband in 39 BC and marry Octavian, the triumvir then rising to power in Rome, even though she was pregnant with her second son, Nero Claudius Drusus, and Octavian’s wife, Scribonia, was pregnant with their daughter, Julia. This marriage was arranged to lend the prestige of Livia’s ancient Claudian clan to Octavian’s lesser patrician family and also to guarantee the amnesty and survival of the Claudian-Nerones family who had earlier joined the assassins of Julius Caesar and fought against Octavian. The marriage lasted for 53 years and was supposedly a love match, but Livia was childless and so concentrated her motherly ambitions on her two sons by her first husband. Typical of Roman Imperial women, Livia was a manipulative personality and she wielded great power through her influence on Augustus, who trusted her opinions. Most historians claim she was so devoted to her husband that she tolerated his many affairs with other women and even encouraged Augustus to pursue them. In the politics of the Empire, Livia acted as a counselor and an advisor to Augustus, and helped to formulate his decisions. This was more than just ‘pillow talk’ between husband and wife. In fact, some authors claim she actually held the power over life and death in the imperial court, a status unusual for a woman in a military society dominated by men. According to the Roman historian, Suetonius, in his book The Twelve Caesars, Caligula, 23, the emperor Caligula, Livia’s great-grandson, called her “Ulysses in petticoats.” Furthermore, all the portrait statues of Livia made her look more beautiful than she really was in order to disguise her dominating personality. As an indication of her power, in AD 15 just after Augustus died, the enate offered Livia the title of Mater Patriae, that is ‘Mother of her Country’. This honorific was the equivalent of her husband’s ‘Pater Patriae’, Father of his Country, a designation conferred on Augustus by the Senate in 2 BC. After defeating Mark Antony at Actium in 31 BC, Octavian assumed total power and began to create an empire. Livia was always at his side and by her noble bearing and proper behavior, she set the pattern for all Roman matrons. To counteract the frivolous and immoral reputation of most Roman aristocratic ladies, Livia adopted a simple and severe hairstyle, based on the hairdo seen on images of the Roman divinities. Art historians call this hairdo the ‘Nodus’ or ‘Augustan’ style. It consisted of a roll of hair, called a nodus in Latin, across the forehead and with the side locks pulled back to form a chignon or small bun at the neck. This hairstyle became Livia’s ‘trade mark’ and very popular among the women in Roman society who wished to be like her. It is interesting to note that some modern women of power, such as Queen Elizabeth II, ex Prime Minister Margaret Thatcher and even Secretary of State, Hillary Clinton, emulate Livia and consistently wear only one style of a hairdo. To assist Augustus’ policy of reintroducing the old family virtues into Roman society, Livia was held out as a role model for all women. Domestically, she lived an unpretentious life and managed her household in a proper fashion. Despite being a ‘power behind the throne’ and influential in imperial matters, Livia dressed simply, rarely wore silk, never put on ostentatious jewelry and behaved outwardly as a modest Roman matron. Popular legends written about Livia even suggested that she was an old-fashioned kind of housewife who cooked the family meals and sewed her own and her husband’s clothes. As usual, there was much vicious gossip and slander surrounding Livia and today it is impossible to separate fact from fiction. In all fairness, one must assume she was neither as good nor as evil as ancient and modern authors say. Tacitus, the 1st century Roman historian, was her worst critic and accused her in his book The Annals, Book 1.3 and 1.6, of causing the murder of the adopted heirs of Augustus, Caius and Lucius, to clear the way for her own son, Tiberius. The historian, Cassius Dio, writing in the 2nd century AD, repeated this ugly rumor in his book, Roman History, Book 53, 33.4, 55, 32 and 57, 3.6. Both these authors are usually dependable, and not know to be falsifiers of history or slanderers, but they both despised the emperor Tiberius and could attack his reputation only by maligning his mother. Today, most historians reject their terrible and outrageous accusation that Livia murdered Augustus by poisoning his dessert of fresh figs. (Tacitus, The Annals Book 1.5 and Dio, History, 55.22.2, and 56.30). This horror story was made popular by the 20th century author, Robert Graves, in his historical novel, I Claudius, but both Tacitus and Dio had devious political agendas that overrode their duties to be honest reporters. 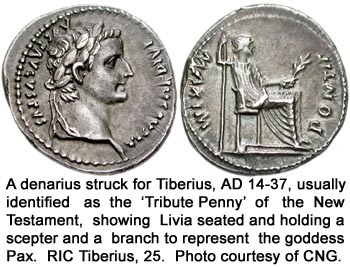 However, Livia’s busts on the ancient coins struck by her son, the Emperor Tiberius, although considered to be merely propaganda images, offer kinder assessments of her character. One extraordinary coin portrays Livia as the deity Pietas, goddess of piety, affection and dutifulness. Divinities were often used to personify the sterling qualities of an ideal Roman matron so, as the ‘First Lady’ of the Empire, Livia Augusta, representing these divinities, became the textbook example of Roman womanhood. 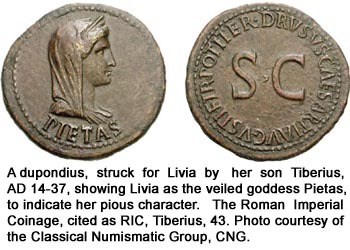 To cultivate this image, Livia was shown in sculpture and on coins dressed and posed as various goddesses. Most remarkably, Tiberius struck a series of dupondii, low denominations of currency and therefore coins that would come frequently into the hands of many Romans, depicting the Augusta as various divine personifications. For example, she is portrayed as the deity Pietas, representing the piety of the people, as Justitia, for the Justice administered to the citizens, and as Salus, symbolic of the Good Health or Well Being of the nation. The dupondius showing the Augusta as Justice is one of the most beautiful Roman coins and this image of Livia became a classic that was copied by many Renaissance era artists. The notion that the Salus Augusta coin indicated that the Empress was recovering from illness was reinforced by another coin struck by Tiberius in AD 22-23. 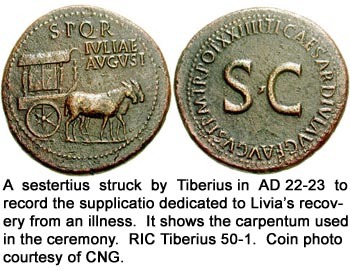 This was a sestertius that showed a mule-drawn ceremonial cart, a ‘carpentum’, used to carry the statue of a deity in a Roman ceremony called a ‘supplicatio’. This was a day of prayer or Thanksgiving decreed by the Senate for the benefit of the Roman people or an individual. 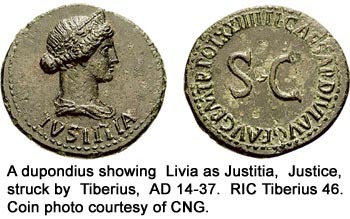 As the coin’s legend states JULIA AUGUSTA, it specifically refers to Livia, the only woman to hold this title at that time. Moreover, Tacitus recorded in his book, The Annals, 3.64, that in AD 22 Livia, 79 years old, fell seriously ill and Tiberius had to return to Rome where the Senate voted a supplicatio on her behalf and dedicated the great games festival, called the Ludi Magni, to her. Augustus’s golden reign lasted for forty-one years and became a cornerstone in the foundations of western civilization. 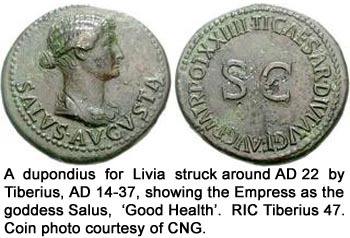 Certainly, Livia must be given credit for her contributions, good or evil, to the progression and success of this reign. The Emperor himself acknowledged the help he received from his wife by striking coins, bearing her image and laudatory inscriptions, throughout the Empire from Spain in the West to Asia in the East. Furthermore, her son Tiberius, when he became emperor, continued this practice and many colonial coins struck for Livia were issued by him. All these coins brought Livia to the admiring attention of the foreign peoples who benefitted from the ‘Pax Romana’, the Roman Peace. One numismatic example will be sufficient to demonstrate this concept. A coin struck in Egypt, a province held as the personal property of the Emperor, showed Livia with her distinctive Nodus hairdo on the obverse and a double cornucopia on the reverse, the classical symbol for double prosperity. This coin marks the first appearance of a Roman Empress on the Alexandrian coinage and it began a tradition that lasted into the 4th century AD. The coin is a bronze diobol, a modest denomination that would be used in the marketplaces and be available to all the people. The obverse legend, in Greek, states LIOYIA SEBASTOY, meaning ‘of Livia Augusta’. The Greek word Sebasth meaning ‘Revered’ is the equivalent of the Latin term Augusta. The reverse legend, also in Greek letters, inscribed around the double cornucopia is PATROS PATRIDOS, meaning the ‘Mother of her Country’, the title awarded by the Senate in AD 15. 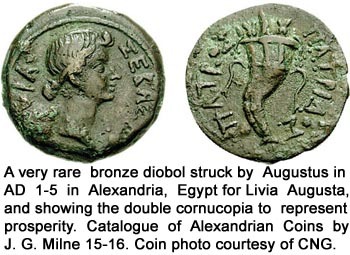 The coin presumably gives Livia credit for bestowing her motherly love and beneficence on Egypt and on Rome, two nations represented by the double cornucopia. After Augustus died in AD 14, he was consecrated by the Senate and Livia built a temple for him near their home on the Palatine Hill in Rome. Unfortunately, this temple soon burned down but was probably rebuilt on a smaller scale as a shrine. (Natural History, by Pliny the Elder, Book XII, 94). Tiberius, when he became the ruler, built a second temple to the Divine Augustus, located behind the Basilica Julia in the Roman Forum. (Tacitus, The Annals, Book 6. 45). 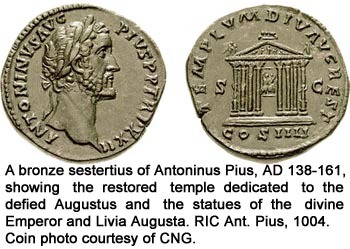 The location of this temple and its remains are now lost to history but during the reign of Antoninus Pius, AD 138-161, a coin was issued showing a temple with the inscription, TEMPLUM DIVI AVG REST, the ‘Temple of the Deified Augustus Restored’. This coin is dated to AD 159 and probably commemorated Antoninus Pius’ renovation of the temple built 130 years earlier by Tiberius. On Pius’ coin two statues are engraved between the central columns, probably representing the deified couple, Augustus and Livia. After her son began his reign, Livia felt that he was falling under the influence of bad advisors, and so she began to exercise more of her authority in the imperial court. Tiberius had always hated his mother’s interference in his affairs because she had forced him to leave his wife, Vipsania Agrippina, in 12 BC and marry Augustus’s dissolute daughter, Julia. This was done as a pragmatic political tactic to enlarge and propagate the Julio-Claudian dynasty but Tiberius truly loved Vipsania and resented the divorce. Historians hostile to Livia claim that because she dabbled in his policies Tiberius withdrew for Rome in AD 26, retired permanently to the island of Capri, and left the governance of the Empire to his underlings. Other historians disagree with this theory and blame other political factors and Tiberius’ difficult personality for his reclusiveness. Livia died in AD 29 at the age of eighty-five but Tiberius refused to execute her will and to honor her memory. Also, Tiberius would not authorize Livia’s deification, a procedure proposed by the senate as appropriate for the widow of the deified Augustus. This ceremony was carried out only in AD 42 by her grandson, Claudius, AD 41-54, after he became the emperor, (The Twelve Caesars, Suetonius, Claudius, 11). 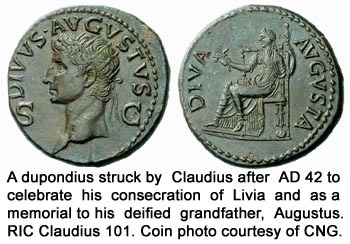 Claudius struck dupondii to commemorate the elevation his grandmother to divinity and included a pictorial reminder of his deified grandfather. The legends on these coins, DIVVS AVGVSTVS and DIVA AVGVSTA, explain the coin’s purpose and Livia is again assimilated with the seated goddess Pax on the reverses, while Augustus is shown wearing the radiate crown and is identified with the sun god, Helios, on the obverses. However the twelve-year delay after Livia’s death denied the first Augusta of Rome, the honor of becoming the first Roman woman to be declared a goddess. In the intervening years, the mad emperor Caligula, Livia’s great-grandson, set the precedent and consecrated his sister and lover, Drusilla, when she died in AD 37, making her a divinity five years before Livia was consecrated. At the end, the historian Tacitus offered an obituary for Livia in his book, The Annals, Book 5, 1, 5. He said many unflattering things and the only good point he could make about Livia was that, “she was a match for the diplomacy of her husband and the dissimulation of her son.” But Tacitus was heavily biased against Livia and she is better known to us as one of the most distinguished woman in the history of Rome. And her influence was far-reaching. 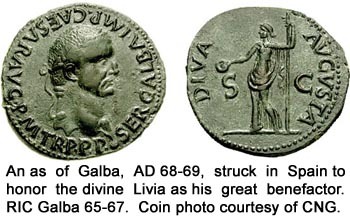 The Emperor Galba, AD 68-69, never forgot how Livia befriended him and became a great benefactor when he was only a simple soldier, fifty years before he assumed the throne. During his short reign he struck gold, silver and bronze coins to honor her memory as the Diva Augusta. These coins, struck at the mint of Tarraco in Spain, show a beautiful, standing Livia holding the attributes of a goddess, her most popular and long-lasting image to the Roman people and to ancient coin collectors.